One of the most unique and beautiful voices of the last 40-plus years, Colin Blunstone falls short with songs that fail to do justice to his gifts. Colin Blunstone has one of the most unique and beautiful voices in popular music. For more than 40 years, his clear, compelling vocals have held millions of fans in thrall through Zombies classics, guest projects, and solo albums. On the heels of last year's successful Zombies reunion celebrating the anniversary of Odessey and Oracle, Blunstone has released The Ghost of You and Me, a record that has been in the works for the last 13 years. A collection of love songs, The Ghost of You and Me starts off with the stirringly soulful title track. An atmospheric, piano-based ballad, it is breath-taking and suitably haunting as Blunstone sings: "I didn't mean to fall in love with you / And baby there's a name for what you put me through / It isn't love, it's robbery / I'm sleeping with the ghost of you and me". He naturally imbues those words with an authenticity and an emotional depth that were entirely lacking in BBMak's 2001 rendition of the tune. It's a heart-wrenching benchmark for the album. Unfortunately, most of the remaining tracks fail to measure up. The second half of the album goes heavier on the strings courtesy of Chris Gunning, who also worked with Blunstone on the 1972 classic "Say You Don't Mind". Sadly, none of these even come close to that masterpiece, and it's again, partly, because of soppy, schmaltzy lyrics. It's also because all of these maudlin melodies are grouped together, dragging down the back end of the album. "Love Left a Long Time Ago" is almost a moment of light among the descending gloom, with a hummable pizzicato tune, but even it gets lost in the leaden laments surrounding it. The Ghost of You and Me ends with "The Sun Will Rise Again", which sounds eerily like Nick Drake in its folkish arrangement, lyrical subject, and in Blunstone's phrasing. This one, too, should be a bright spot, but it seems somehow misplaced in the track listing, and as the album's end note it loses any power it may have otherwise possessed. 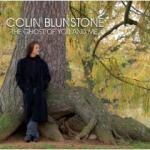 Nevertheless, Colin Blunstone's ethereal voice still shines with an undimmed brilliance and undeniable beauty. Let's hope his next record won't squander such magnificence on substandard songs.